BAT - BLOG : BATMAN TOYS and COLLECTIBLES: New #BATMAN #BATMOBILE Replica Car To Appear at #BATCAT MUSEUM OF TOYS in Thailand! 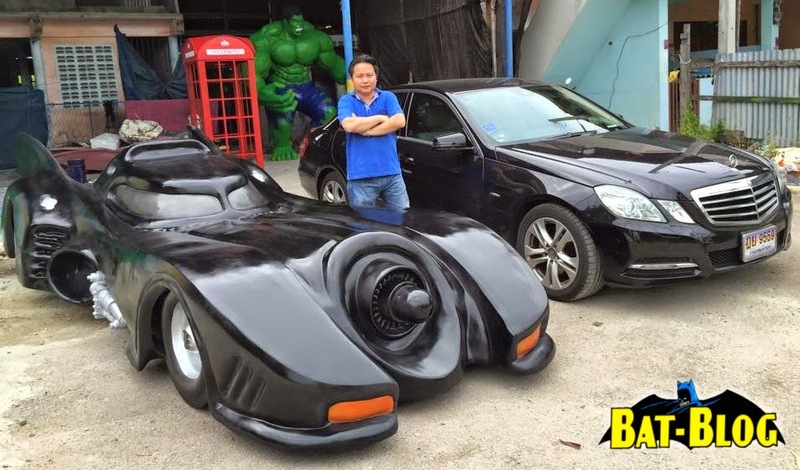 New #BATMAN #BATMOBILE Replica Car To Appear at #BATCAT MUSEUM OF TOYS in Thailand! OK, I had to do this quick post to share this fun photo I got the other day from my good friend Somchay (a.k.a. Bat-Cat). It appears that he bought himself a Batmobile Replica Car! Yes, this guy is a pretty serious Batman Fan and I guess he felt he needed a new car so... here we go! Now, I don't know if he bought this for his personal collection or if he plans to showcase it at his Toy Museum. Oh yeah, Somchay owns the famous BATCAT TOY MUSEUM in Thailand and I'm guessing he bought it to display there. That place is filled with tons of cool stuff like this and, while they cover a lot of different movie & cartoon characters, it's main focus is "Batman". So, I bet this car will be on display there later. For more information on the BATCAT TOY MUSEUM, please CLICK HERE!